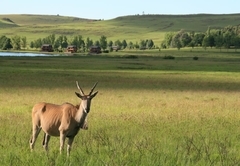 Sani Valley Lodge is a 4 star graded game lodge offering Sani Pass accommodation for tourists and visitors of Drakensberg. 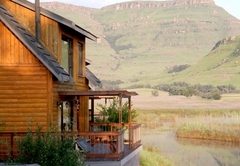 Located a short distance from Himeville and Underberg and half way up the Sani Pass, Sani valley is a private game lodge in the Southern Drakensberg. 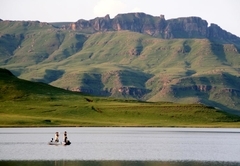 It is the only private game lodge in the Natal Southern Drakensberg and has some of the most sought after "wild trout" fishing in the entire Drakensberg region. 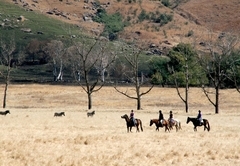 Sani Valley Lodge is a unique blend of nature, activity and luxury accommodation (a mix between an upmarket Bed & Breakfast and Guest House or Hotel). 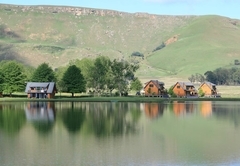 Overlooking a 260 acre lake at the foot of the spectacular Drakensberg Sani Pass, Sani Valley Lodge offers you total privacy, refinement, tranquility and an extensive range of exciting activities. 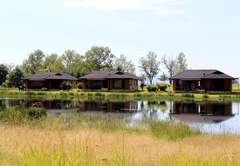 The accommodation includes full private kitchens, lounges and dinner tables allowing you to chose to cook your own meals and have someone clean and wash.
All the lodges offer a spacious and open lounge/dining room/fully equipped kitchen. 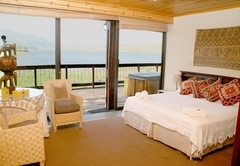 Whether in your bedroom or in the lounge, you simply have to step out through the large sliding door onto the private verandah to get a panoramic view of the lake and the spectacular Drakensberg mountains. 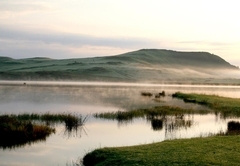 In winter you will particularly enjoy the comfort of a cosy fireplace in the lounge, electric blankets, overhead heating along with heated towel rails in the bathrooms. 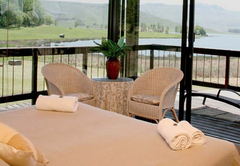 Largest chalet available at Sani Valley. It has 3 luxurious en-suite bedrooms that can accommodate up to six people comfortably. This unit is truly a luxury home away from home. Surround deck with elevated view of lake & mountain; Fully equipped kitchen with all modern fixtures & fittings; DSTV and DVD player in lounge / Gas Jetmaster fireplace in lounge; 2 bedrooms en-suite with separate shower and bath and one bedroom with shower only; Overhead heating in bathrooms as well as heated towel rails; Braai facilities / Undercover parking at Reception nearby; Digital coded safes; Surround glass in living area and main bedroom to enhance views; Private jetty on to water (shared with Bushman); Heated blankets and Ceiling fans. 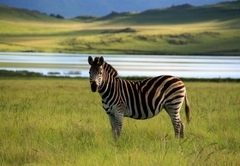 2 bedroom en-suite lodge exquisitely decorated in African themes with original African artefacts and embroideries. This unit has magnificent elevated views of the lake and breathtaking mountain views. Surround deck with elevated view of lake & mountain; Fully equipped kitchen with all modern fixtures & fittings; DSTV and DVD player in lounge / Gas Jetmaster fireplace in lounge; Both bedrooms en-suite with separate shower & bath; Overhead heating in bathrooms as well as heated towel rails; Braai facilities / Undercover parking at Reception nearby; Digital coded safe; Surround glass in living area & main bedroom to enhance views; Private jetty on to water (shared with Rainbow). Three beautifully decorated semi-detached one bedroom units. 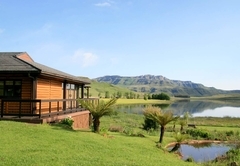 Each unit has magnificent lake and mountain views from lounges & bedrooms. There are two units downstairs and one unit upstairs. Separate lounge and dining area; Bedroom with glass surrounds to absorb the views; Bathrooms with double vanity, bath and separate shower; Over head heating in bathrooms; Heated blakets & heated towel rails; Modern open plan kitchen with all appliances; Log fire places; TV, DSTV with DVD player; Private patio with beautiful views; Braai facilities; Undercover parking. Exquisitely decorated, double story stand-alone units. Ideal for honeymooners. 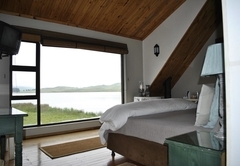 Magnificent lake and mountain views from living area, bedroom and bathroom. Ideally sleeps 2 people but does have a small nook behind the main bedroom with a double stack bed which is suitable for young children. Surround decks going on to water; Fully equipped kitchen with all modern fixtures & fittings; TV’S in lounge and bedroom / DSTV and DVD Player; Private Jacuzzi build into the deck; Stunning feature bathroom with view windows; Jetmaster fire place; Heated blankets and heated towel rails; Under cover parking; Braai facilities. These are exquisitely decorated, stand-alone units. You will have magnificent lake and mountain views from living area and bedroom. Each one ideally sleeps 2 people (ideal for honeymooners) but does have a small bedroom at the back with a double stack bed suitable for young children. If the Jacuzzi doesn't do it for you, the view of Ndlovini Mountain perfectly framed from your king-size bed will blow your mind! 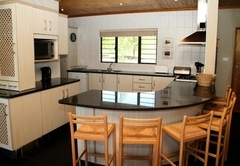 Fully equipped kitchen with all modern fixtures & fittings, TV in bedroom, DSTV & DVD Player. A private jacuzzi build into the deck, stunning feature bay window in bedroom. Jet master fire place, heated blankets & heated towel rails, under floor heating in main bedroom and bathroom. 3 stand-alone chalets with lake and mountain views. Each chalet features a main en-suite bedroom with king size bed and a small nook alongside the main bedroom with two single beds (suitable for children). Ideal for couples, small families and groups. 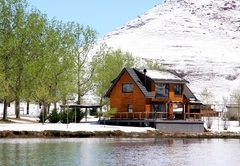 3 stand-alone chalets with lake and mountain views. Each unit features one main double bedroom and a second bedroom with two single beds (preferably for 2 children). Ideal for couples, small families and groups. 3 semi-detached one bedroom chalets with en-suite bathroom and a private deck with lake and mountain views. Ideal for couples and groups. No children allowed, unless all 3 units are booked at once. 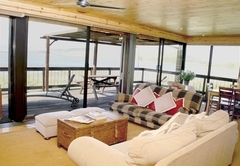 A large and uniquely decorated chalet featuring two en-suite bedrooms with magnificent views of the lake and mountains. The unit can accommodate two extra people on sleeper couches, please enquire with reservations. Ideal for families and groups. A large spacious and private chalet featuring 3 luxurious en-suite bedrooms with stunning elevated views of the lake and mountains. Ideal for families and groups. Please enquire with reservations for extra bedding for small children. What an awesome venue to spend some quality time. Everything was superb. Saw the berg covered in snow too. We will definately come back for a longer stay. Thanx too all the staff who made our stay so enjoyable. 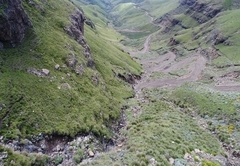 Response timeSani Valley Lodge typically responds to requests in 5-10 minutes.